Tutorial example of calculating deformation and deflection in a spanner where the geometry is given in and imported from a STL CAD file. This model is available as an automated tutorial by selecting Model Examples and Tutorials... > Structural Mechanics > Deformation of a Spanner from the File menu. Or alternatively, follow the step-by-step instructions below. Select the Linear Elasticity physics mode from the Select Physics drop-down menu. The spanner geometry will be imported from an STL file Instead of creating it with the built-in CAD tools. Select Import Geometry > STL Format.. from the Geometry menu, and choose the spanner1.stl file to import. Enter 5 into the Subdomain Grid Size edit field. Equation and material coefficients are be specified in Equation/Subdomain mode. In the Equation Settings dialog box that automatically opens, enter 0.29 for the Poisson's ratio and 190e3 for the Modulus of elasticity. The other coefficients can be left to their default values. Press OK to finish the equation and subdomain settings specification. Note that FEATool works with any unit system, and it is up to the user to use consistent units for geometry dimensions, material, equation, and boundary coefficients. Here the geometry scale is in mm and thus the units of the equation coefficients have been adjusted accordingly. Fix the displacement in all directions for the jaws of the spanner. Select 13 and 14 in the Boundaries list box. Select the Fixed displacement, w radio button. Enter the equivalent load expression F/A*(y>140) on one of the side boundaries. The switch expression ensures that the load is only active and applied on the top section where y is larger than 140 mm. Enter 1000/(6*80)*(y>140) into the Displacement/load, x-component edit field. Plot the displacement and verify that the maximum displacement is around 2.5 mm. Enter 0.25 into the Deformation scale factor edit field. 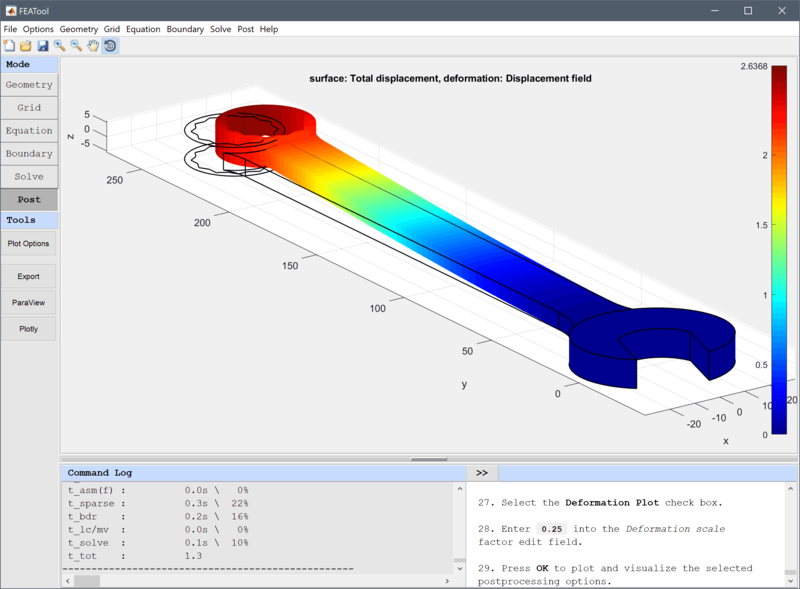 The deformation of a spanner structural mechanics model has now been completed and can be saved as a binary (.fea) model file, or exported as a programmable MATLAB m-script text file, or GUI script (.fes) file.